What kinds of motorcycle helmets are best for you and the way you ride? It's a simple question. But with the wide variety of helmet styles and manufactures to choose from, maybe it's not so simple. Your motorcycle helmet is arguably the most vital piece of rider gear you use to ride safe, aware and comfortable. Think of it this way, when examining a rider's serious head injuries after a motorcycle accident, what are the chances of an emergency room doctor saying, "Good thing he wasn't wearing a motorcycle helmet." Head injuries account for the majority of motorcycle fatalities. Should you even wear a motorcycle helmet? Let's be honest. When bad things happen, such as a severe motorcycle accident, even the "safest" or "best" helmet can give you only minimal protection. Wearing a helmet can't guarantee you will not lose your life or be seriously injured in a motorcycle crash. 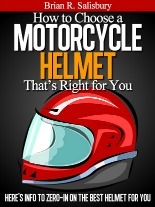 So even though you have many kinds of motorcycle helmets to choose from, why wear one at all? When I first started riding motorcycles, no laws required me to wear a helmet. Even though I owned a high-quality helmet, I didn't wear it all the time. Bugs, rocks and trash of all sorts hit me in the face -- frequently at high speeds. It really hurt and usually made me take my eyes off the road. During one ride, a bee stung me inside my mouth. The pain and surprise almost sent me out of control. Riding in heavy rain was painful and distracting -- as well as bone chilling. During long trips, the wind roaring past my ears was annoying and uncomfortable. And the roaring continued in my head for hours after I'd stop. Dirt and grime would coat my face, especially after driving on muddy roads or through dusty construction areas. None of these problems occurred when I wore a helmet -- particularly a helmet equipped with a faceshield. These days I always wear a full-face motorcycle helmet when I ride. A helmet's thin, rigid outer shell protects your head from abrasions and puncture wounds. The shells of most kinds of motorcycle helmets are made of strong lightweight plastics or fiberglass composites. Some are made of advanced, lightweight materials such as Kevlar or carbon fiber. The thick foam lining under the shell is made of expanded polystyrene (EPS). This lightweight, crushable stuff protects you by absorbing, spreading and reducing the high-impact energy that otherwise would traumatize your head and brain in a crash. The many kinds of motorcycle helmets have a padded interior lining that surrounds and holds your head and creates the snug, comfortable fit you want. Helmets with removable, variable-sized cheek pads -- which are part of the lining -- let you fine-tune the fit. You can also remove and wash these and other detachable lining sections to keep your helmet clean. 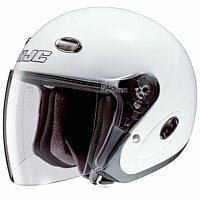 A sturdy chin strap cinched down with a pair of D-rings holds most kinds of motorcycle helmets in place. This basic yet vital component keeps all of a helmet's potentially life saving protection where it belongs when you ride and if you crash. 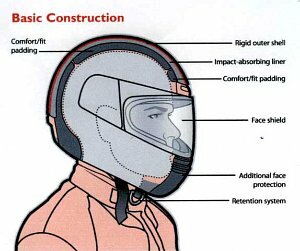 Which kinds of motorcycle helmets suit you best? When determining which kinds of motorcycle helmets are best for you, I suggest you make protection and comfort your first and most important priorities. My full-face helmet is quite comfortable. During long trips I have no trouble wearing it for hours at a time, even when I stop for gas. When you're clear on your own riding habits and preferences, you're ready to start narrowing down your choices among the many kinds of motorcycle helmets. A full-face helmet gives you the most protection because it totally covers your head and most of your face. Should protecting your face concern you? Protecting my face concerns me, especially when I visualize myself flying chin-first into the back of a car or planting my nose into a gravel roadbed. 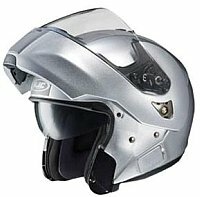 With a full-face helmet you see the road and everything happening around you through the helmet's wrap-around eye port. This opening extends far enough on either side of your eyes and is high enough to allow complete peripheral vision. 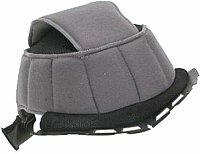 A clear or tinted acrylic visor covers this opening and protects your eyes. You can lift the visor partially or all the way for ventilation. The helmet's padded interior keeps a firm hold on your head and reduces wind noise. Even though I wear ear plugs inside my full-face helmet to further reduce wind noise when I ride, "important" sounds such as voices, car horns, car engines and emergency vehicles reach me loud and clear. Some riders don't choose a full-face helmet because, for them, its size, weight and wind resistance cause the greatest amount of neck fatigue compared to the way other kinds of motorcycle helmets are designed. 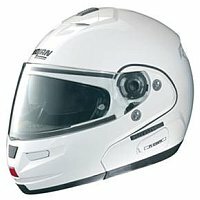 I've never experienced neck fatigue or wind resistance problems when wearing a full face helmet. Some faceshield attachment/removal systems are much easier to operate than others. Look for the easy kind. The eye port on some full coverage kinds of motorcycle helmets gives you a higher opening than others. 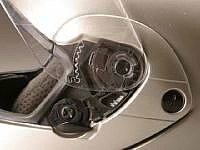 This feature can be important to sport bike owners who want a higher opening to compensate for lower handlebars and their "sport bike riding crouch." 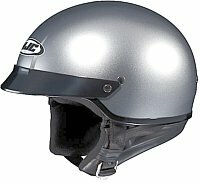 The ability to remove and easily keep your helmet lining clean is a definite feature to look for among full coverage kinds of motorcycle helmets. Even if you don't wear prescription eyewear, make sure your helmet gives you enough room behind the face shield to accommodate your sunglasses comfortably. Everybody's head is a different shape. 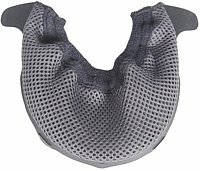 Among the many full coverage kinds of motorcycle helmets, look for a design that lets you try different size cheek pads so you can fine-tune the helmet's fit just right. Full-face helmets can get hot inside. That's why you want one with an effective ventilation system to keep you cool and prevent faceshield fogging. Make sure you can easily operate your helmet's vent system with your gloves on. After you cinch down your chin strap, it's nice to have a simple fastener to keep the loose end from flapping. And the fastener should be easy to connect when you're wearing gloves. Many riders like to use an in-helmet communication and/or sound system. If you're one of them, make sure whatever kinds of motorcycle helmets you're evaluating provides room for your speakers. My helmet came with an optional "chin bar skirt" designed to prevent cold, turbulent winds from swirling up into my helmet from below. I've never attached it and I've never noticed an "updraft" problem. But maybe such a skirt would make riding more comfortable for you. So give it a try. Open-face helmets cover your head, but not as much as a full-face helmet. A three-quarter open-face helmet will give you a significant amount of head protection when comparing it to the other kinds of motorcycle helmets. But it doesn't wrap as far around your face as a full-face helmet does. And it doesn't include a chin-bar to protect your jaw like a full-face lid can. This helmet extends from your brow, back over the top of your head to the base of your neck and forward over your ears. Your eyes are protected by either a built-in faceshield/visor or with goggles or other sturdy eyewear. A chinstrap holds everything in place. Many riders favor this design because they can communicate easily with the helmet on. Police offices like it because they can quickly remove the helmet without blocking their vision. Half-shell open-face helmets cover only the top half of your head. That's why they're often called beanie helmets. Most leave your face, ears and the base of your skull exposed and vulnerable. When compared to the other kinds of motorcycle helmets, this design gives you the bare minimum of helmet safety. Many riders wear half-shells because, in relation to other kinds of helmets, beanies weigh the least, offer the lease wind resistance and don't cover their ears. 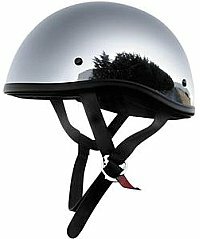 Actually, these "minimalist" lids enable riders to come as close as possible to not wearing a helmet when the law says they must. Keeping an open-face helmet in place, especially a helmet that has a small faceshield or none at all to block the wind can be a real problem. Wind forced into the helmet can lift it up and cause the chin strap to tug at your neck. That's why many riders run the strap through a chin cup that absorbs the tension and makes it easy to keep the helmet down. If you wear an open face helmet, you're always at risk of getting hit in the face with bugs, rain and debris. Hot and cold winds hammering your skin are a bummer. You don't get such abuse with other kinds of motorcycle helmets. So, if your helmet doesn’t have a faceshield, it's wise to always protect your eyes behind pair of goggles or sunglasses. And many riders cover their nose and mouth with at least a bandana to protect their face from dirt, bugs, rain, cold or dry winds and other harsh conditions. Flip-up/modular helmets, aim to combine the attractive features of full-face and three-quarter helmets in one design. Some riders like this design because it gives them extra space for sunglasses or prescription eyewear. Some modular helmets are very easy to open and some stay closed better than others. Look for a flip-up that gives you easy access but will stay shut when you really need the protection in an accident. Off-road/dirt bike motorcycle helmets offer the same degree of protection as full-face street helmets. Prominent features of this design include a protruding chin guard and an elongated, shade-providing "brim" over the eye port. 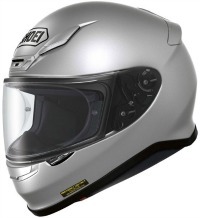 A visor does not cover the eye port because these kinds of motorcycle helmets this helmet is made to be worn with goggles. Off-road helmets are prone to minor damage from flying rocks and low-hanging branches. You benefit most when your helmet has an easily replaceable brim and other eternal parts. Off-road riding is physically demanding, so look for a helmet that has an effective ventilation system to keep you cool and comfortable. After a day of off-road riding, you want a helmet with removable cheek pads and liner parts you can wash and re-install with ease. It really doesn't matter which motorcycle helmets you're looking at. 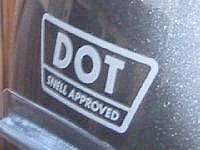 Before your start trying one on, check to see that it has at least a DOT (Department of Transportation) certification decal on it. Better yet, it should also have Snell (Snell Memorial Foundation) decal on it. Why should you care about these certifications? The U.S. government's DOT, and the private, not-for-profit Snell Foundation have established motorcycle helmet safety standards in the United States. DOT standards are the minimum that all motorcycle helmets intended for U.S. public streets must meet. 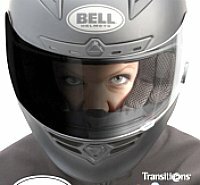 Snell has set voluntary motorcycle helmet safety standards that are higher than DOT's. A helmet doesn't have to meet Snell's standards to be street legal. But a helmet with both a DOT and Snell sticker on it means the manufacturer has worked hard to have its product meet the highest protection standards. Higher quality helmet faceshields will have DOT certification info molded into it. A Snell-certified helmet should Snell-certified faceshield. The important thing is, if you purchase a helmet that hasn't been certified at least by DOT, you're getting minimal protection...actually yu could be getting no protection at all. Learn all you can about the different kinds of motorcycle helmets on the market -- their designs, brands, models and features -- before you start shopping for one. That should give you a pretty good idea as to what style of helmet you want most and how you expect it to perform. 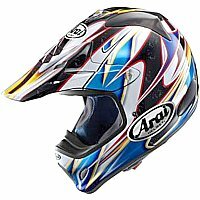 You have many excellent kinds of motorcycle helmets made by many expert manufacturers to choose from. Don't be influenced by any single company's image, artistic helmet graphics or marketing budget. In addition to being the right choice for you regarding its design and technical excellence, make sure the helmet you choose is the most comfortable and has the features you want. After you get it, please use your helmet whenever you ride. And as an extra precaution, please wear earplugs. You'll find all the helmet evaluation and selection information appearing in this website -- and more -- in my book, "How to Choose a Motorcycle Helmet." Click here or on the book cover for a description of the book's contents and to download your own copy.